Hi everyone I am thrilled to do a guest post today. For those who don’t know me I like to experiment and often have I wonder if moments. On my work desk was bottles of pretty Ken Oliver Liquid Metals and an embossing folder which had not been put away. Although I had previously used a cosmetic sponge with the Liquid Metals after embossing I decided to see what would happen if I used the Liquid Metals on the folder itself. I love how the background for my card turned out. I also love how my Teresa Collins eBosser is still going strong. My other go to tool is the eBrush and once again I had to do some experimenting. For the top layer of the butterfly I eBrushed using a Spectrum Noir marker and then used a mister to spray rubbing alcohol. I didn’t get the result I was after and next time I’ll get a brush wet with the alcohol and flick it. I can see using the mister perhaps on a section if you want to get a sun bleached look to your paper. Definitely a lot quicker and more controlled than if you manually tried to sun bleach paper. Glitter glue on the butterfly base and Martha Stewart flocking (which had never been open) for the antennae complete the butterfly. Add a die cut sentiment and there you have it an elegant card that anyone would be pleased to receive. 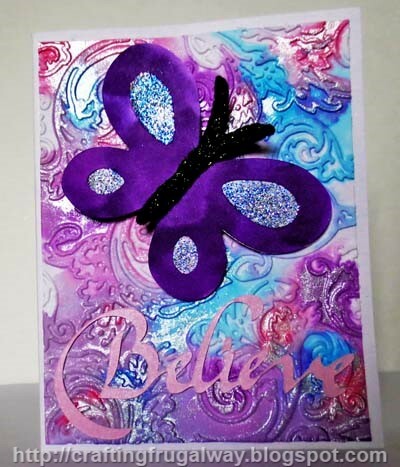 I hope I have inspired you to get out your embossing machine and folders and play. As well as to get out your eBrush if you have one and see what you can do that may be different. I’m thinking as I write this that a tie dye effect could probably be done by eBrushing with more than one color and then misting with alcohol. Did I mention that my mind is often coming up with I wonder moments. Thank you for stopping by today. Also thanks for having me as a guest designer.